Last week, my friend Kim emailed to thank me for the crayon roll that I’d made her for her giveaway prize. This reminded me that I’d intended to make Ellie one. Thinking it would be fun for her to pick out fabric, I let her choose. She, of course, wanted to look at the pink stack first and then fixated on one piece of fabric that is indeed beautiful but of which I only had scraps. Then she wanted to look at the blue prints and chose the blue/orange giraffe print from Mark’s quilt. Friends, I just COULD NOT make myself put those two together. I had decided in advance to go with whatever she chose but I just couldn’t. So I convinced her to choose a couple more pinks, made a patchwork panel and this is what we came up with for the outside. She wanted the green/pink print – appropriately from the “Santorini” fabric line (Santorini being an amazing Greek island that Nik and I visited in 2008). She also insisted on baby blue bias tape for the straps. All in all, we ended up with a finished product I never would have designed on my own but she likes it and that’s what counts, right? This is probably the Lord’s way of helping me learn to give up absolute control over my kids! I’m just practicing for when they’re teenagers and really have their own opinions. 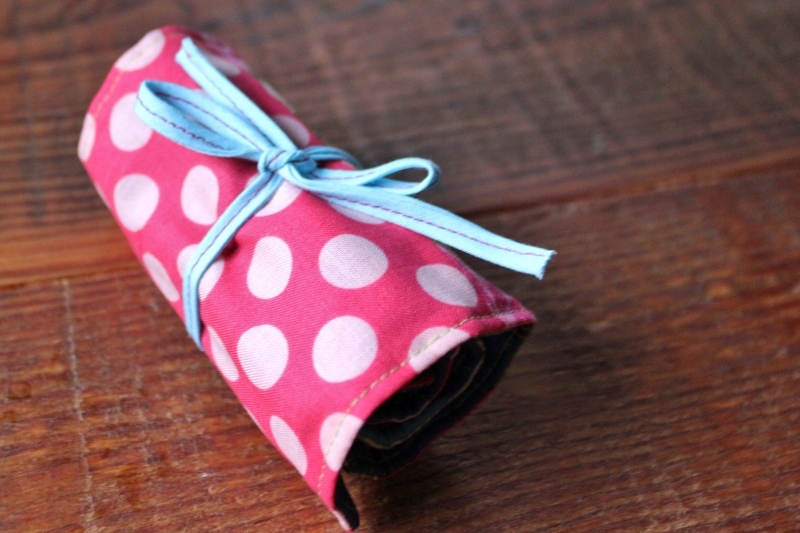 This entry was posted in sewing and tagged crayon roll. Bookmark the permalink.